The oldest part of the church dates back to the 13th century. The church was enlarged during the 15th century and later had restoration work done under Sir George Gilbert Scott in the 19th century. The arcade – most of the windows and the south porch date from this time. The octagonal font is 13th/15 century. The wrought iron top is modern. 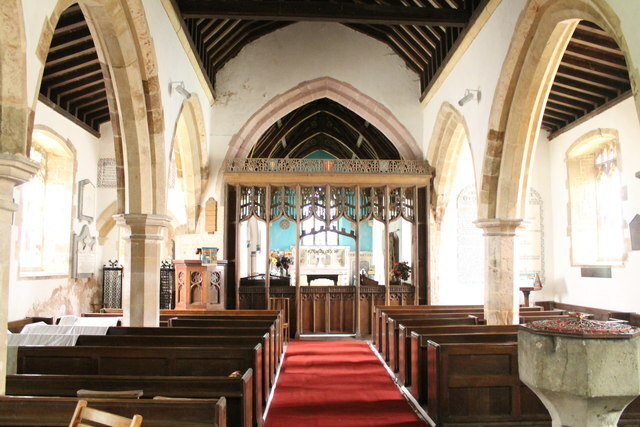 The church has north and south aisles and a north chapel. The late 13th C 3 bay arcades have double chamfered arches with octagonal piers and moulded capitals. On the voussoirs are extensive traces of red painted foliage. The lower part of the tower is 13th century and retains the original narrow tower arch and small lancet window in the west wall. The upper tower was added in the 14th century together with the window. The reredos dated 1860 is mosaic and marble and displays Italian workmanship. 1870-74 George G Scott Jnr, urgent restoration work. © Copyright J.Hannan-Briggs and licensed for reuse under this Creative Commons Licence.